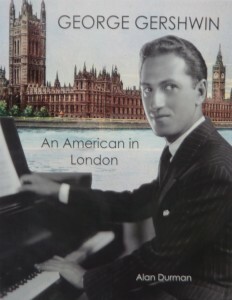 There are many biographies of George Gershwin, but I was intrigued by his visits to London and Europe in the 1920s. What was his reception like? Where did he go? What were these shows, and how different were they from their American versions? What did the critics think? Who were the stars? Where were they performed? How did George settle down in Europe? Who did he meet? The answers took me to second-hand bookshops, Ebay, contemporary newspapers and magazines, and libraries (including the British Library and the Library of Congress in WashingtonDC). In my book, I have used around 300 black and white and colour photographs taken on my travels in London, New York and Washington, sheet music covers, and production photographs printed in contemporary magazines. There are millions of fans of Gershwin’s music around the world. New biographies and recordings of his concert music and songs appear often. Revivals of ‘Porgy and Bess’ and Gershwin musicals are also produced regularly, and ‘new’ Gershwin musicals like ‘Crazy For You,’ ‘My One and Only’ and, this year, ‘Nice Work If You Can Get It’ have been very successful. This book is aimed at these enthusiasts who would be keen to immerse themselves in George Gershwin’s 1920s world. A LIMITED NUMBER OF SIGNED COPIES OF ‘AN AMERICAN IN LONDON’ ARE AVAILABLE FROM THIS SITE.